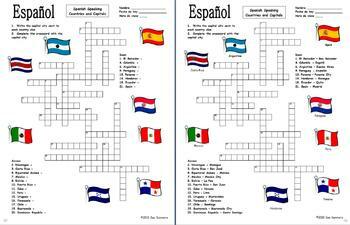 Spanish Crossword BUNDLE of 10 - Family, Colors, Clothing, Greetings, and More! This crossword includes the 20 official Spanish speaking countries, plus Puerto Rico. Also included are 8 clip art images of flags from Spanish speaking countries. 1. Write the capital next to each country clue. 2. Complete the crossword with the capital of each Spanish speaking country. If desired, you may also have the students write the country under each of the 8 flag images. This crossword is a good substitute lesson plan. Students first find the countries and capitals on a map or from a list, if you prefer. After completing the crossword and flag IDs, students can work with partners quizzing each other on the countries and capitals. Please click here to see more of my Spanish speaking countries materials. 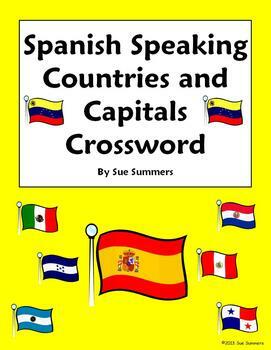 Spanish Speaking Countries and Capitals Crossword and Flag IDs by Sue Summers is licensed under a Creative Commons Attribution-NonCommercial-NoDerivs 3.0 Unported License.